Qualifying Employer: the employer must have a written policy that provides all qualifying employees at least two weeks of annual paid FMLA leave (prorated for part-time employees). The leave policy must provide payment of at least 50% of normal wages. 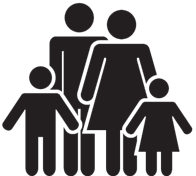 Qualifying Family and Medical Leave: birth of employee’s child, placement of child for adoption or foster care, care for employee’s spouse/child/parents with serious health condition, serious personal health condition, qualifying exigency due to employee’s spouse/child/parent being on active duty in Armed Forces, and care for a service member who is the employee’s spouse/child/parent/next of kin. Qualifying Employee: employee that is employed for at least one year or more and has not earned more than $72,000 of compensation in 2017 to take the credit in 2018 ($72,000 for 2019 credit as well). 12 consecutive months are not required, as the employer must use any reasonable method to determine length of employment. 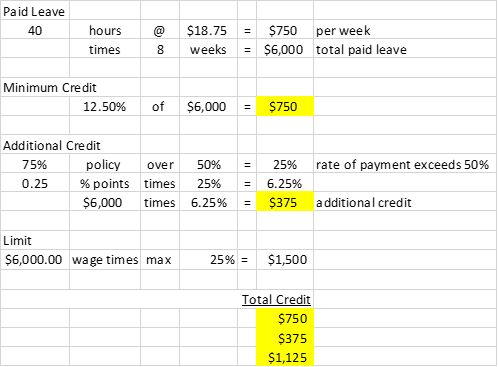 Credit: 12.5% of wages paid during leave period if employee is paid at least 50% of normal pay during the leave period. The credit increases by 0.25% for each percentage point the rate of payment for the leave period is over 50% for a maximum of 25%. For example, Company ABC has a qualifying written policy in place for medical leave. Employee A is normally paid $25/hr. Employee A has a baby and will be on leave for 8 weeks receiving 75% of her normal pay or $18.75 ($25 x 75%). The employer will receive a credit of $1,125 thus reducing salaries and wage expense by the credit. Salaries and wage deduction on Page 1 of the tax return will be reduced by the amount of credit, as seen with the Hurricane Irma (employee retention credit). Any leave paid by state or local government or required by state or local law is not considered in this calculation. If an employee is not covered by title I of the FMLA (works less than 1,250 hours), the written policy must include noninterference language. The employee must be a qualifying employee before the medical leave begins. They do not qualify if the leave is taken and then only after becomes a qualifying employee. If an employee is paid salary, his/her wages are prorated to an hourly wage rate for the credit calculation. A policy is treated as in place on the retroactive effective date if the policy is adopted on or before December 31, 2018. Please contact our office with any questions at 407-998-9000 or bkhm@bkhmcpa.com.